The 1916 Easter Rising centennial arrived this year with an abundance of books, films, websites and social media dedicated to this seminal event in Irish history. The global content output–from traditional media and academic sources to bloggers, amateur historians and anyone else with a Facebook page or Twitter handle–is particularly extraordinary given all the typesetting troubles of publishing the 1916 Proclamation in the basement of Dublin’s Liberty Hall. Q: What’s been the biggest surprise of doing this project, or something you thought you knew about the Rising but now think differently? CF: To be honest, before I started working on our film ‘A Terrible Beauty’ and the ‘Stories from 1916’ project, my knowledge of the 1916 Rising was fairly limited. I have always been interested in history but I’m not a historian, and as such, what I knew about the events of 1916 was what I had learnt in school…Pearse, Connolly, the GPO, etc. Most people you speak with are probably in a similar situation and that’s why we took the decision to focus on the “ordinary” people involved: Irish rebel, British soldier and civilian caught up in the fighting. The biggest surprise has probably been just how involved Irish-America was in the lead up to the Rising and beyond. 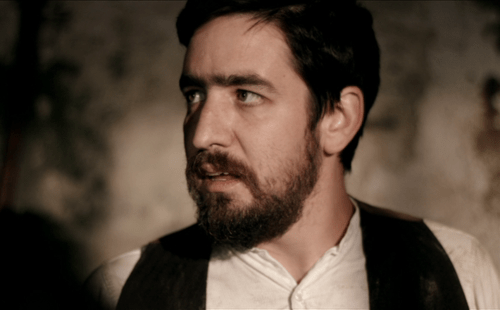 Colin Farrell playing Peader O’Donnell in the Tile Media produced ‘Jubilee Nurse’ TV pilot. Q: Stories from 1916 gives more attention to American connections to the Rising than many other websites. How did this come about? CF: It’s definitely fair to say that we focus on the Irish-American connection to 1916 more than most. The reason for this is that we feel the story isn’t complete without recognizing the massive contribution that Irish-America made to Ireland’s revolutionary period from 1912-22. The vast majority of funding for the rebellion came from the States, but also politically, there was a huge amount of support through organizations like Clan na Gael and the Friends of Irish Freedom. That link is one which we feel hasn’t been fully explored up to now, outside of the purely academic world, so it’s one we’re very interested in. Ultimately, we’d like to produce a 70-80 minute online documentary that would tell this story, from the foundations laid by the old Fenians, right through to the early days of the Irish Free State and how America played it’s part in it all. Q: What’s your favorite story from the project thus far, and why? CF: I think my favorite story so far has been ‘A Courier’s Tale‘, the story of Tommy O’Connor. To me, he really epitomizes what we are trying to do with ‘Stories from 1916’. This is a guy who is almost completely unknown, including in the academic world, but who is so important to the fight for Irish freedom. As the IRB’s Trans-Atlantic courier, he is carrying vast sums of money home to Ireland, millions in today’s currency. Also, some of the most important messages from the U.S. to Ireland. He’s basically a spy, and who doesn’t like a good spy story! As well as his covert work, he fights in the Rising and was involved in the rescue of the Titanic‘s survivors as a crew member of the Carpathia…a ripping yarn altogether! It’s also one that I like because of the serendipity involved in how we came across it. I had been looking at the Bureau of Military History statements online, searching for names that weren’t listed as Irish Volunteers or Citizen’s Army, and came across Tommy who was listed as a courier for the IRB. I then looked into his pension records and came across the presidential pardon he received from Calvin Coolidge. Literally the next day, one of his living relatives sent us an email, it was just meant to be! Since then we’ve become great friends with his family, so it is a story that is close to my heart. Part 2: Telling history in the digital age. This entry was posted in Arts & Culture, History, Irish America and tagged Colin Farrell, Tile Media on April 9, 2016 by admin.